It’s Saturday and we have an exciting supplier reveal for you! I absolutely love reading YA. Most recently I’ve enjoyed The Wicked King by Holly Black, and I only just picked up Cinder by Marissa Meyer at the end of last year, so I’m up to Cress and loving that too. I’m also eager to read Defy Me by Tahereh Mafi and Danielle L Jensen’s new book, Dark Shores. I have my favourites among our range of candles. I love Button Eyes (big fan of Coraline!) and Wizard Beer, because with the two-tone wax it looks like a pint of butterbeer! The houses collection we have with the gold metallic labels really stand out to us too. We actually opened the shop 2 years ago with 5 candles, and among those was our Poison Apple candle. It was the first one we ever made and it still remains one of our bestselling candles, so we’re proud of that one sticking around so long and remaining popular! We have a study in our apartment, lined with bookshelves, a comfy chair in the corner and a desk. There’s a cupboard in there where our candles are stored. We can both sit in there if Andy is at the computer designing labels. We also pack up orders in there too and have everything we need stored in a unicorn basket! To make candles I don’t have the most space, so I either clear the desk and create a workspace in there, or for larger quantities I go over to my parents’ house and take over a bigger room there! If I’m working on a big order I don’t really stop for long as I always have wax melting away and something to be doing. I’ll usually make a quick lunch. I have soft drinks with me all day, and someone usually makes me a few cups of tea! I sometimes listen to music, or an audiobook, but sometimes I just enjoy the silence. Probably lots! Last time I was making a lot of jars, I dropped one and hot wax splashed over the floor. That wasn’t fun to clean up! I also tipped up a big box of lids once and it was like the doubling charm in Bellatrix’s vault. We’d talked briefly about making bookish candles and then we helped out at a craft fair and thought we could have had a stall if we’d started. So we came away inspired and began experimenting, testing and coming up with ideas and label designs. The following year we did have a stall at the same craft fair! We get our inspiration from books and movie adaptations. We’re always pointing out what would be good as a candle name and noting it down. We often plan far in advance and we’re currently working on lots of new designs! Andy is a graphic designer full time. He likes beer, so we enjoy visiting breweries or beer shops. He likes going to gigs too. I currently work part-time and write YA books, so I’m currently working on a new manuscript as well as proposals for a publisher. I also love walking, Lush baths and gin! We recently visited the Alchemist and they had this amazing frothing butterbeer cocktail. You can’t beat a good TV series either so we enjoy discovering new things to watch. 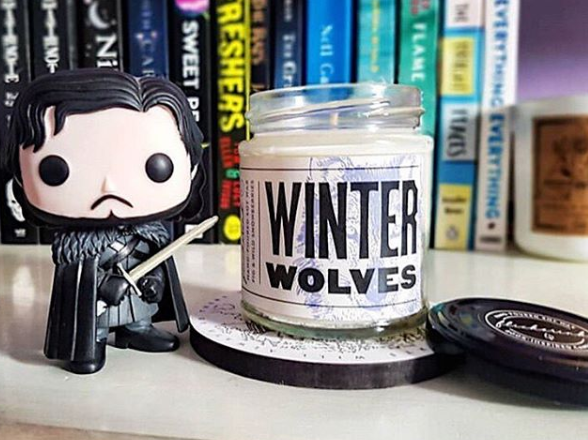 We are super excited for the return of Game of Thrones next week – we’ll be burning our Winter Wolves candle! 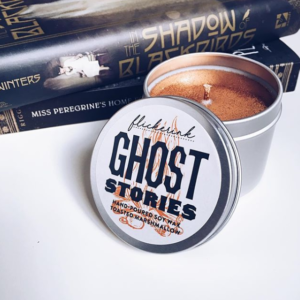 All of our May SEIZE THE CROWN Book Box Club members will receive a beautiful exclusive candle hand-poured by Flickerink and inspired by one of our all-time-favourite magical retellings .We’ve had a blast working with the lovely Kate and Andy (the brains behind Flickerink) and they’ve come up with the most gorgeous scented candle that’s so perfect for our May theme. The candle that we’ll be including will truly be fit for royalty, full of sparkles and gorgeously scented! If you want to explore more of the world of Flickerink Candles, check out their Etsy shop and Instagram now and give them a follow! If you’re yet to join us, here’s why you won’t miss out on our May SEIZE THE CROWN box. Our featured read is a beautifully-written fantasy retelling about a real royal dynasty that has long sparked controversy. It’s an emotional battle for survival full of magic and unlikely alliances. If you are a fan of Katherine Arden’s Winternight Trilogy or The Book Thief you are sure to love this mystical twist on a true story. This book is a brand new hardback YA release (from an author who we already love), which will arrive gift-wrapped and accompanied by a signed bookplate from the author. Book Box Club subscribers will also receive a curated selection of bookish goodies inspired by some of our favourite gracious monarchs and wicked rulers. As well as a beautifully bookish, exclusive candle hand-poured by Flickerink, get ready for items inspired by The Cruel Prince, Disney, our featured read and more! All our our members will be invited to an exclusive online book group, where you’ll get the chance to meet the author of this brilliant book and ask her your questions! Book Group is always one of the highlights of our month, we can’t wait to chat to you all! Our May boxes and Purely Books parcels are available from our subscriptions page and are selling fast so make sure you join us now to avoid disappointment! If you are already one of our lovely members, your SEIZE THE CROWN box has been set aside for you. Please make sure that your details are up-to-date for renewal day on the 25th April. We look forward to sending you your box around May 15th.